It’s the hottest topic in the tech world—certainly at this week’s Mobile World Congress (MWC) trade show in Barcelona, Spain—it is. The next generation of wireless networks—commonly called 5G—is on the lips of most people you speak to, in the majority of press announcements, and mentioned in just about every meeting in which I’ve participated. 5G is critically important for several reasons. Not only will it offer major speed increases (up to multiple gigabits/second versus current averages of around 15-20 mbits/second), it will also reduce the delays, or latency, in network traffic, and it will dramatically increase the density and reliability of wireless networks. The problem is, the messages being shared regarding this important new technology are quite different; in some cases, diametrically so. Not only the basic concepts, but the time lines, the capabilities, and the overall relevance. The result is a lot of confusion with regard to what exactly is coming, and when and what it all means. While it’s easy to blame the problem on the hype surrounding 5G—and there’s unquestionably a lot of that—there are important and reasonably valid reasons for some of this confusion. In each case, the situation basically boils down to several different perspectives from different industry participants being mixed together into a jumbled mess. While many may cringe at the thought, we could start to see companies talking about 4.5G or super 4G or early 5G or some other variation. First, it’s important to remember that there are two key paths towards 5G, the network path—being touted by key network equipment providers like Ericsson, Huawei and Nokia, as well many major carriers—and the component and device path—driven by Qualcomm, Intel and others. As with any broadband technology, there’s a key chicken vs. egg discussion when it comes to 5G. You have to have the network support in order to enable devices, but you need enough devices (or at least the promise of them), to justify the enormous investment in core networking equipment required. Not surprisingly, the big network companies are pushing 5G hardest, but carriers (particularly Verizon) are also starting to make a great deal of noise about the “imminent” arrival of 5G trials. Of course, trials are not the same thing as widespread deployment that we can all use, but some believe that even doing trials is a bit risky at this point because the final 5G technical standards have not been ratified. The key technologies expected to be part of the final 5G standard, including things such as millimeter wave radios, are extremely difficult to implement, particularly on a widespread basis, so there’s still lots of testing and other work to be done. Another key difference of opinion on 5G is more philosophical: the idealists versus the realists. 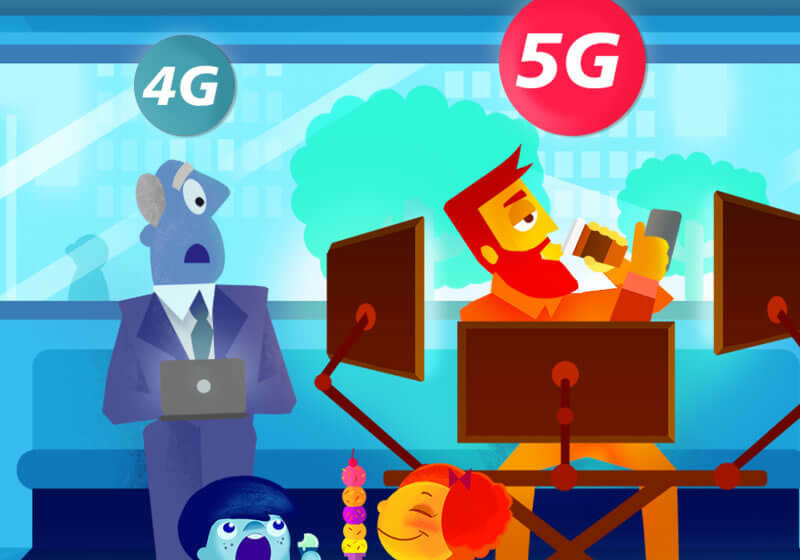 Driven in part by some of these engineering challenges, as well as basic business model issues, it’s easy to find yourself on different sides of the “5G is nearly here” debate, depending on whom you speak with. The more optimistic side is talking about wider availability in 2018 or 2019, while those who consider themselves more realistic are saying it will be 2020 before 5G is something that we’ll actually be able to use. Some of these dates are being driven by key events: both the 2018 Winter Olympics in South Korea and the 2020 Summer Olympics in Japan are expected to be critical milestones for wider testing/adoption of 5G. The third and final reason for differences on 5G timing and relevance stems from the reality that incremental improvements in network performance and capabilities occur at numerous points in between the roughly once a decade jump in telecom network generations. As T-Mobile CTO Neville Ray mentioned in a conversation we had here, it’s best to think of a concept like ten steps along the way from 4G and 5G. For both technical and practical reasons, there isn’t a single major jump that occurs when a transition from 4G to 5G occurs. (This was also the case between 3G and 4G.) Instead, a number of key capabilities that are typically perceived as part of the next generation are added to the current generation as one of these “steps.” For example, while gigabit/second level speeds are commonly touted as a key characteristic of 5G, at this week’s MWC, there were a number of announcements around Gigabit LTE—that is, gigabit/second speeds on 4G. Qualcomm’s new X16, X20 and X50 family modems, as well as Intel’s XMM7560 modem, for example, offer the promise of Gigabit speeds much sooner, and Sony’s new Xperia XZ Premium—powered by the new Snapdragon 835 from Qualcomm, which incorporates the X16 modem—is the first smartphone with a Gigabit LTE-capable modem. As a result of this (and all the previous perspective differences), it wouldn’t be terribly surprising if we start to see some companies talking about new kinds of “intermediate” technology or even network names. While many may cringe at the thought, we could start to see companies talking about 4.5G or super 4G or early 5G or some other variation. While I can understand the desire to differentiate in a crowded market, these short-term marketing efforts will undoubtedly just complicate the issue, and confuse consumers even more than this transition is likely to do anyway. It’s clear that none of the various participants in the 5G value chain are trying to create confusion. They genuinely believe in their view of how and when their pieces will arrive, and what they can do. However, without recognizing the many varied perspectives that they each bring to the table, it’s very difficult to understand how all these pieces will fit together. As a result, I have a feeling the path to 5G is going to be a lot messier than many would like.